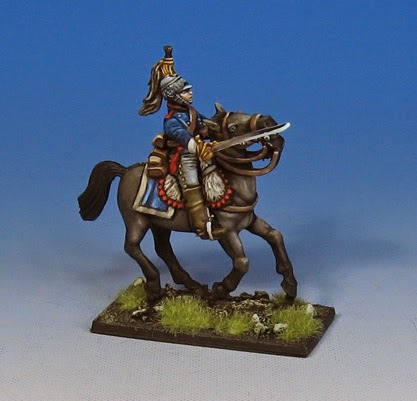 While I was painting miniatures from 5 different companies (and 5 different genres), I had a few colors out on the palette that I thought could make an interesting horse color. I wanted to have a very dark brown horse, but to also make it slightly different from the myriad of previously painted browns. I had a muted, darker flesh tone and some black sitting there, and I mixed them together to see what I had. This mixing of various colors with black is pretty common for me. Mixing cyan, purple, green, etc,, with black yields some incredible gray combinations! 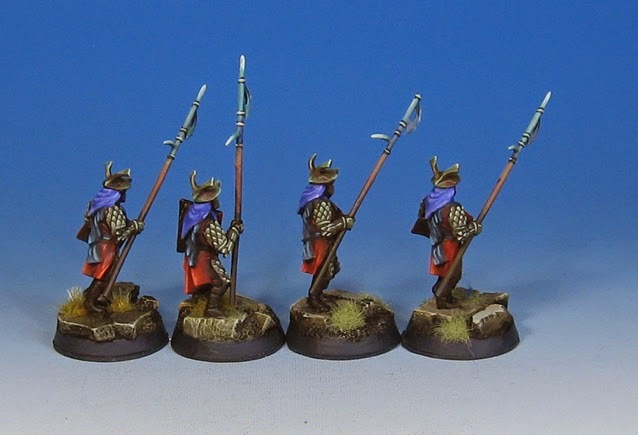 Very handy for NMM, to say the least!! In this case, I wanted the hooves, tail and mane to be as dark as possible. Mixing that flesh color with the black gave me a war grayish brown, and I loved it right away. 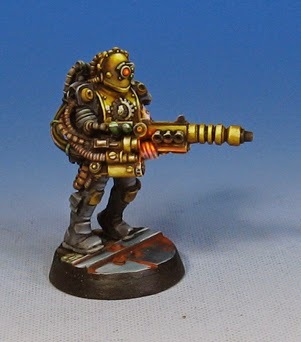 I had been using that color on a Mechanicum heavy transport, as well as western figures, Mierce miniatures, Privateer Press miniatures, Reaper minis, Secret Weapon minis, and probably a few others that I am leaving out. Oh... Memoir '44! It's been very interesting painting such a vast array of topics all at once. This really keeps thing fresh, especially when the painting day begins at 7am and goes until 3-4 am the following day. 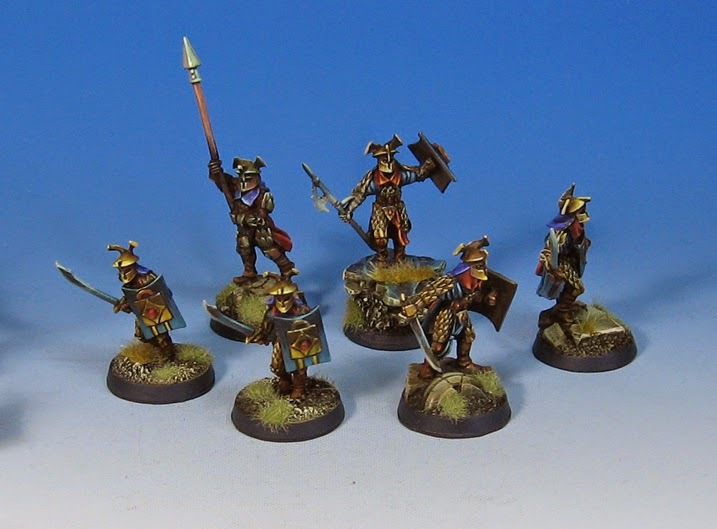 No matter how many of these I paint, they will still seem tiny compared to the Thanatars and Automatons. Those things were so massive, I think they have permanently altered my perception! 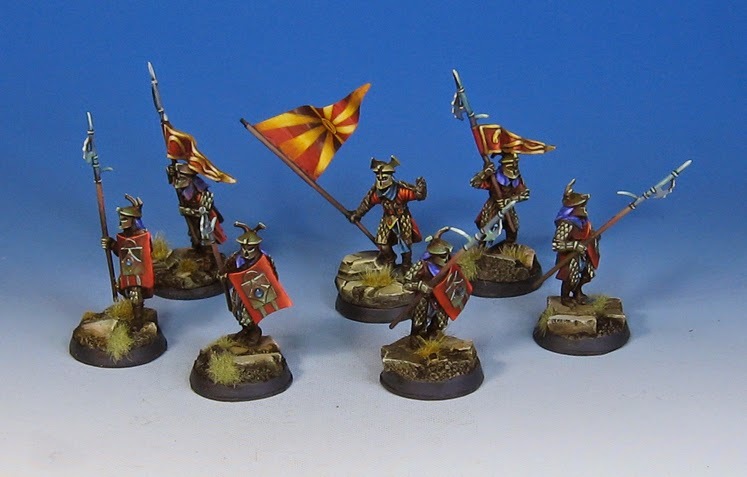 From the very moment I started painting minis, the color schemes were influenced not only by the story of the army, team, etc., but also by practical needs on the gaming table. 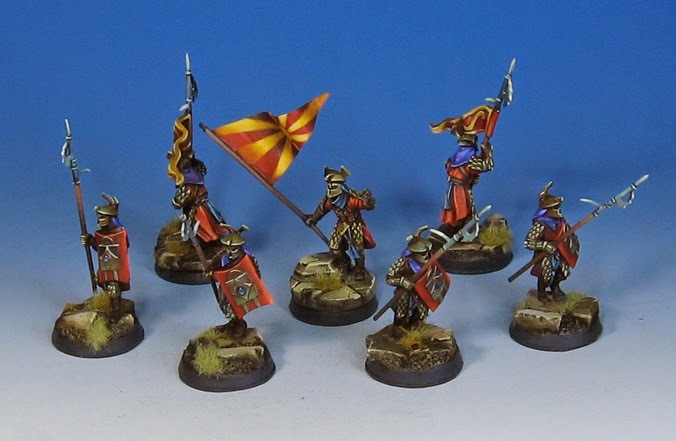 Often this meant coming up with color schemes, basing, freehand, or other hobby methods to help distinguish one type of unit or figure from another rapidly, even in a scrum. Lord of the Rings turned out to be one of those potential 'scrum' games, with many different individual figures in a larger swirling mass of combat. 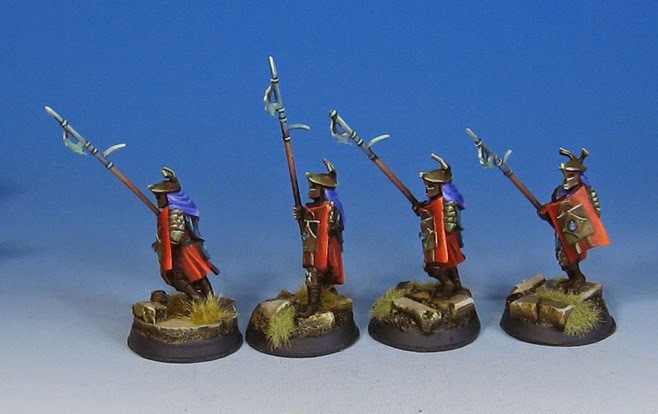 To tell the 'regular' Easterlings from the Dragon Knights, I used dark blue on the Dragon versions, with a more 'traditional' red scheme such as this for the standard pikemen. 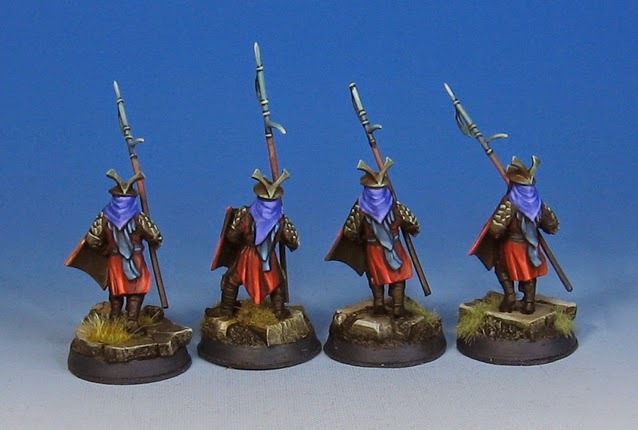 This was very crucial, since in LOTR, you need to know exactly who is standing behind the first set of figures offering support. It's important to know right away the relative fight skill of the two figures potentially working together. 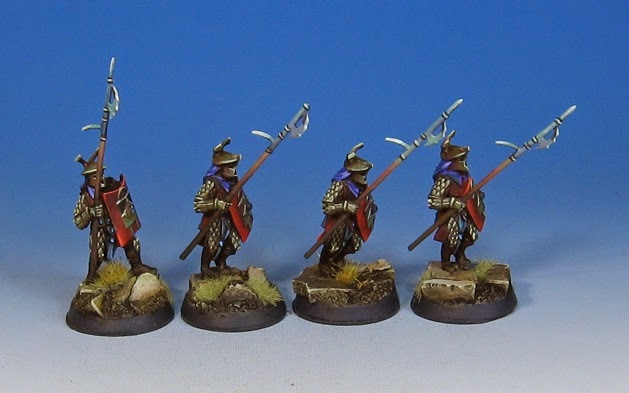 The Dragon Knights would be out front with sword, shield, and the higher fight skill, with the less talented, but still deadly pikemen behind. The one thing in common between them was the purple of the headdress. It was just enough to link the two together! 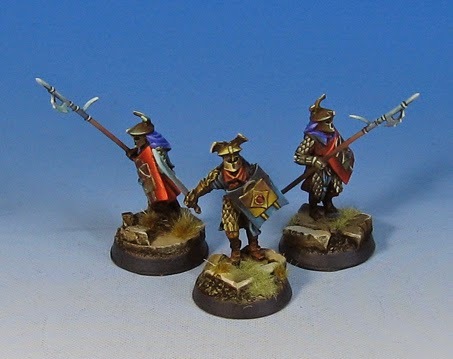 And a set of the Dragon Knights on foot. 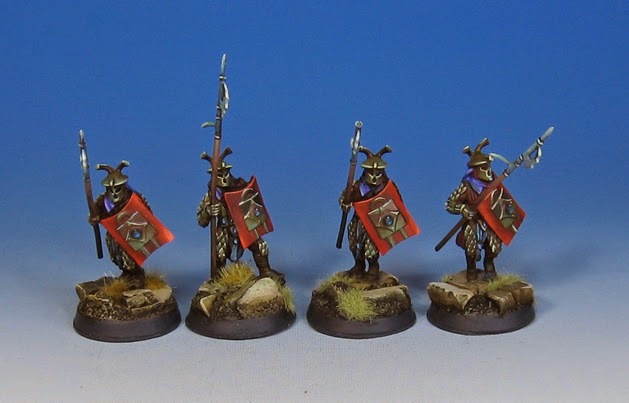 The armor of the Dragon Knights also had a warmer gold tone, while the underlings had more bronze/brass coloration.